Bedside table with no drawers. One dresser for me an one for The Husband. Lamps hanged in the wall above bedside tables. My next step was to look around my bedroom and my house for items that help me achieve this without spending money. This is called: Work With What You Have. 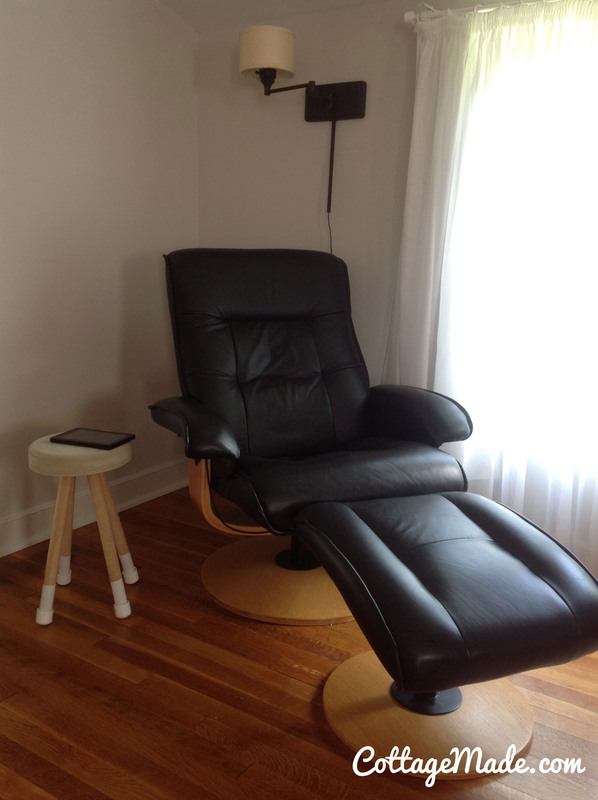 I moved The Husband’s black reading chair from the office to the bedroom. I am keeping my IKEA white bed and I bought a white bedspread for $40 dollars at HomeGoods. I added a red bench also from IKEA, that I originally had it in our kitchen table. 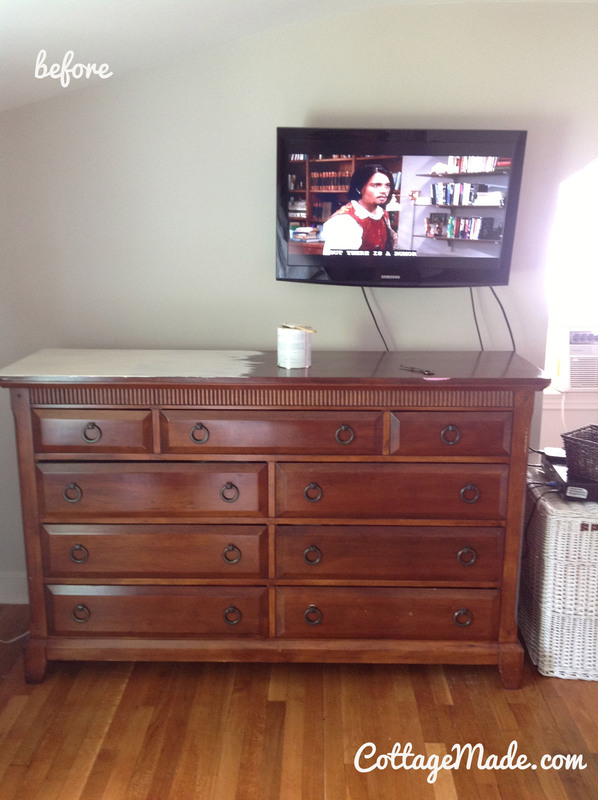 Now…dressers. 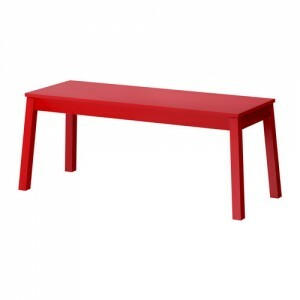 Option 1 was to get some affordable version at IKEA too. Option 2 was to keep my dressers and re-vive them. The Husband made it easy. Option 2. Basically my motto is. Don’t like it? Paint it. That is what I did. 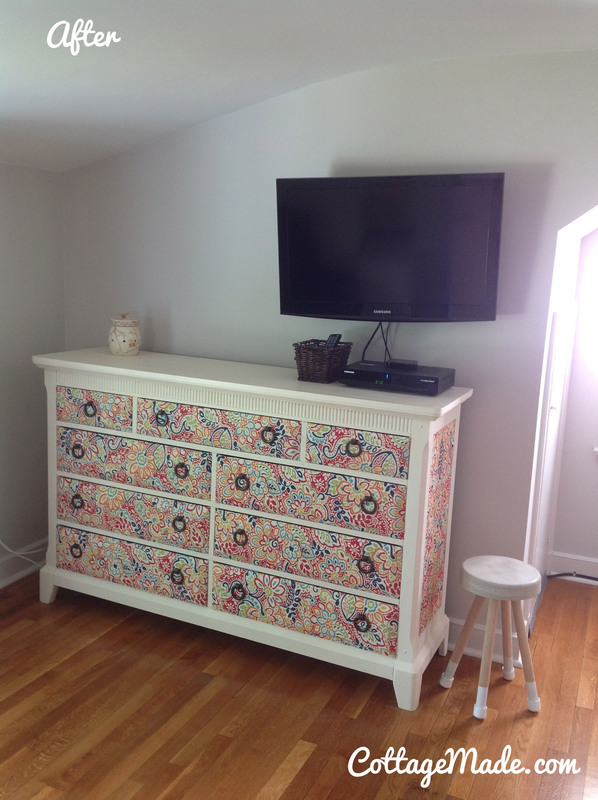 I painted one dresser white and I upholster the drawers and side panel. It was easy and not as much time consuming, because I did it at night after the kids went to bed, for 1 hour each day. Total of 4 days…watching TV and drinking wine was part of the operation. 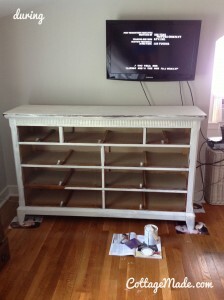 I used Old White Chalk Paint from Anne Sloan. Great paint for indoors furniture. Specially because it dries super fast and it is water based, so any mess you do in your hardwood floors is totally cleanable with H2O. For the drawers I used fabric that was on discount at Joann’s Fabric because it was a left over batch. Now… You might think. “I am not handy to accomplish something like this.” You are. 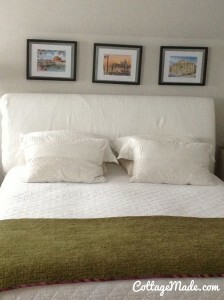 All you need is a brush to paint, staple gun to upholster the fabric, scissors and glue. 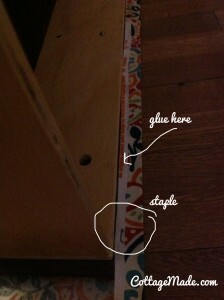 Just measure the drawers on the fabric. Cut the pieces. Doesn’t need to be perfect. Staple it tight. 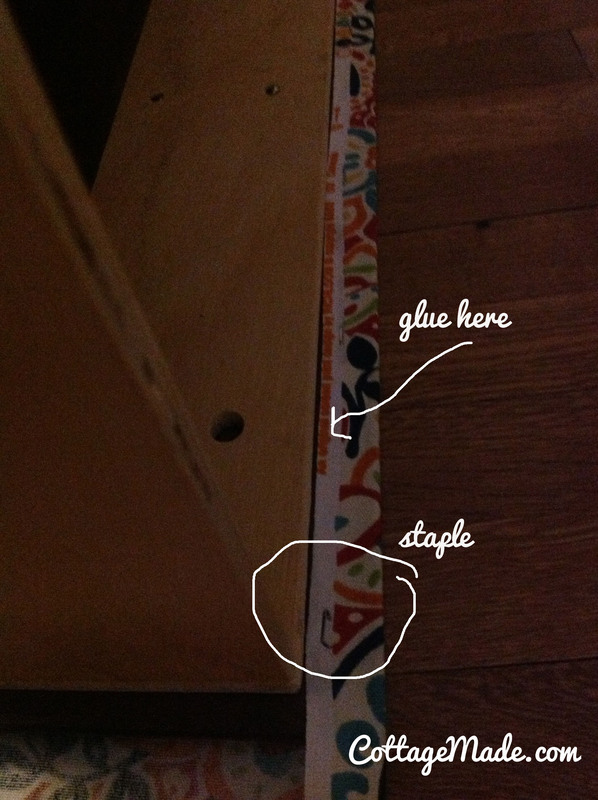 Then use glue (e.g. white, wallpaper, mod lodge) on the edges so if there is any imperfection it gets glued in the furniture and the fabric stays in place. 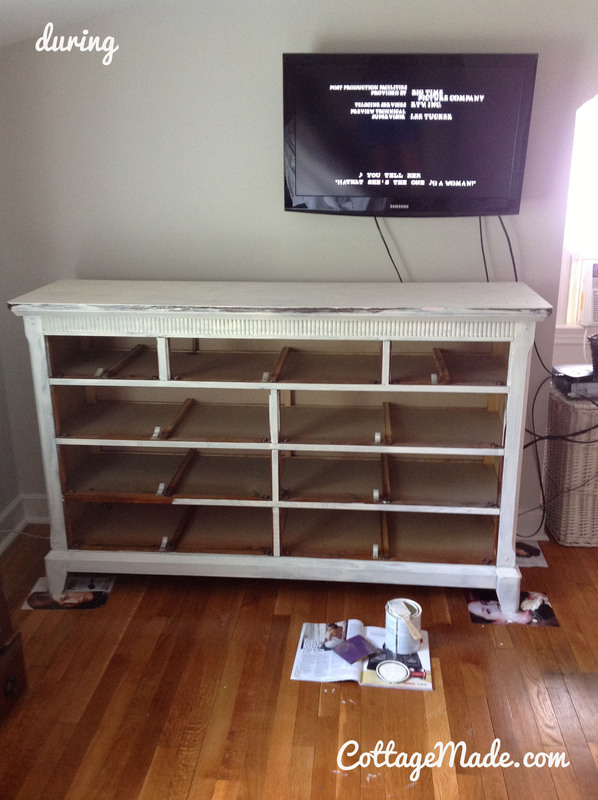 Next step, The Husband’s dresser and bedside tables. 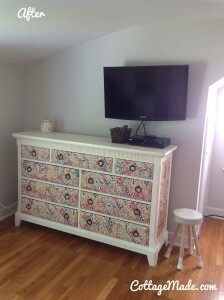 For The Husband’s dresser I am thinking of choosing one of the colors from the fabric used in the dresser and just paint it all with that color. For the bedside tables I don’t know yet. Any suggestions?